Victorian Cottage with Wraparound Porch, Sleeps up to 12. 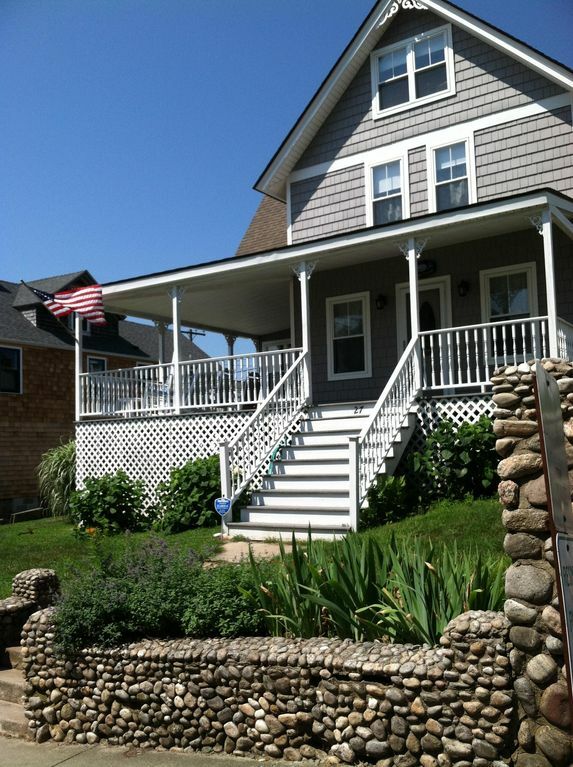 Lovely Victorian cottage for rent in Niantic/Crescent Beach, CT.
A half block from the beach, this is a water-lovers dream vacation spot! Love the water but not the sun? Lounge in a rocker and enjoy the waterview from the wrap-around covered porch or enjoy the quiet solitude of the backyard patio. Additional sleeping quarters are available in the partially finished attic and will accommodate up to 4 more people; so the cottage can sleep as many as 12 people comfortably. There are 2 showers (1 in the bathhouse and 1 in the upstairs bathroom) & there is a 1/2 bath on the main floor. There's a fully equipped kitchen - stove, refrigerator, coffee pot, toaster, dishwasher and microwave. As well as both a gas grill and a charcoal grill. The dining room table expands to seat 10-12. Additional amenities include a washer and dryer and a 2nd refrigerator, ideal for drinks, in the back hall. The living room boasts a working fireplace to stave off the occasional chilly summer evening. My favorite thing to do is watch the sunrise, and moon rise, from a rocker on the porch. This house has been in my family for three generations and I look forward to passing it along to my own children someday. In the meantime, we'd like you to make your own memories here at my family's cottage. Lovely sunsets and sunrises - if you're an early bird - walking distance to town - ice cream, movie theater, etc and a half block to the beach and the snack bar. And we're on a regular route for the ice cream truck. what's not to love! Beach has a lifeguard from June 25 to Labor Day. You can also use the clothesline located in the side yard, just off the porch. There is also a small family-friendly movie library. Nice cottage. It had everything you could need. The porch with the rockers was amazing. My family had a great family vacation. Hope to go back again. Thank you BettyLou! So glad that you created some wonderful memories at our home. The porch is so amazing & until you sit in 1 of the rockers & look out at the water, you have no idea how amazing it is. Sitting on the porch with a direct view of Crescent Beach, short walk to the playground, Tony D's for homemade icecream, the nursery with fresh veggies and homemade goods.....family we haven't connected with in years less than a half mile walk by the road and less by the beach path....can't wait to do it again! Loved the large shower in the bath house, too! All your ammenities included! Similar to our Cape Cod vacations at about half the cost and without the traffic! The view was fantastic! We enjoyed sitting on the deck in the rockers and watched the sun go down daily. The kids loved the beach and checking out the rocks for seashore treasures. It was great being able to go back & forth throughout the day. We had a terrific week fillled with plenty of sunshine & fun. Truly enjoyed our family vacation!! Thank you Arlene. We love that you had such a wonderful time in our treasured family home. My family of 10 and 2 month old baby had an amazing time here. The beach is closer than the pictures imply and is so convenient. The view is the best in the area. There is a road between the house and beach but there is minimal traffic and wasn’t a bother. We spent most of our time on the huge deck, there was room for everyone with plenty of chairs. The patio in the back was great for barbecuing and catching afternoon sunshine. The dining room table seated all of us, whether it was for eating or playing board games. This place is great for a large group. The stairs to the attic bedrooms are a little steep but manageable. My kids loved sleeping up there, it reminded them of their grandpa’s farm. We really had a great time here and was everything we were expecting. It is always a delight to me when a renter enjoys our family home as we have over the years. Thank you for staying at the Fairmont cottage. Cute little cottage right by the beach! The cottage has a great view! It is a bit older however, and the attic is very cold in the off season and has no heater. The stairs are somewhat steep and not small child friendly. The pictures are accurate. Cleanliness I give a 3/5, I had to wipe out crumbs from the fridge and we moved a small side table in the living room and found lots of dust/the floor had not been mopped under in quite some time. Lots of sleeping spaces however and reasonable price. Loved the cottage! The porch is wonderful! We had the pleasure of renting the cottage over Memorial Day weekend while in town for a baseball tournament. Twelve of us between the ages of 10 and 74 all fit comfortably and the cottage was so much better than a hotel. It had everything we needed and the view from the porch is fantastic. It's not fancy, but it was perfect!